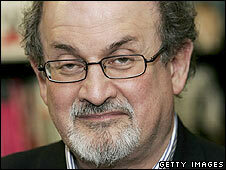 Sir Salman Rushdie's novel Midnight's Children has won the Best of the Booker prize, as voted for by the public. The 1981 book beat five other former Booker winners shortlisted from the prize's 40-year history. Sir Salman, who was unable to attend the London ceremony as he is currently on tour in the US, sent his thanks via a pre-recorded message. It is the third Booker award for the author, who was also the winner of the Booker of Bookers in 1993. "Marvellous news - I'm absolutely delighted and would like to thank all those readers around the world who voted for Midnight's Children," the author said. His sons, Zafar and Milan, were in attendance at the award ceremony at London's South Bank Centre to receive the custom-made trophy. "It's a wonderful alternative to have my real children accepting the prize on behalf of my imaginary children," Sir Salman said. When voting closed at 1200 BST on 8 July, 7,801 people had voted via online and text, with 36% voting for Midnight's Children. Peter Carey, Pat Barker, JM Coetzee, Nadine Gordimer and JG Farrell were also shortlisted for the prize. The shortlist was chosen by a panel of experts including novelist and critic Victoria Glendinning and broadcaster Mariella Frostrup. "The readers have spoken - in their thousands. And we do believe that they have made the right choice," Glendinning said. She added that Midnight's Children had won by a "quite a large margin". The Booker Prize, which was first awarded in 1969, has spawned 41 winners because it was shared between two authors in 1974 and 1992. How do you win a Booker prize?